Supplementary information for the paper "Alternative Tree-Cover States of the Boreal Ecosystem: a Conceptual Model" by B. Abis and V. Brovkin, GEB, 2018. The folder contains a Supplementary Companion for the main manuscript, and separate folders containing data and scripts to reproduce the results of the paper. Additional information can be found in the README file. Aim: Previous analyses of remotely-sensed data detected the multimodality of the tree-cover distribution of the boreal forest, and identified areas with potentially alternative tree-cover states. 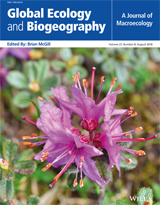 This paper aims at investigating the causes of multimodality and multistability of the boreal forest, their influence on the asymmetric tree-species distribution between Eurasia and North America, and whether multistability could be associated with recent greening trends in LAI/NDVI. Location: Eurasian and North American boreal forests. Time period: 2000--2010. Major taxa studied: Boreal forest plant functional types. Methods: We employ a conceptual model based on tree-species competition to simulate the sensitivity of tree cover to stochastic disturbances and to changes in environmental factors. We include different plant functional types based on survival adaptations, and force the model with remotely-sensed environmental data. We analyse the model as a dynamical system. We use metrics from statistics and information theory to compare the detection of alternative tree-cover states and greening trends in LAI/NDVI. Results: We find that multimodality and multistability can emerge through competition between different plant functional types. Additionally, our model is able to reproduce the asymmetry in tree-species distribution between Eurasia and North America. Moreover, changes in permafrost distribution can be associated with phenomenological bifurcation points of the model. Finally, we find that the detection of multistable areas is not affected by recent vegetation trends, whereas shifts between alternative states could have affected the greening trends. Main conclusions: Tree-cover multistability in the boreal region can emerge through competition between species subject to periodic disturbances. Changes in permafrost thaw and distribution could be responsible for the asymmetry in tree-species distribution between North America and Eurasia. Climate change and permafrost degradation could cause shifts in tree-cover states and dominant species. Recent vegetation greening trends in multistable areas could have been affected by shifts between alternative states.